Here is a photo, zoological garden, taken at in Fermathe Haiti at the Centre Evangelique Wallace Turnbull. There are no tigers, no bears, no elephants, and no giraffes yet, but you will certainly see a monkey, snakes, alligators, exotic birds, and a whole lot more while contemplating the beautiful haitian mountains in the background. 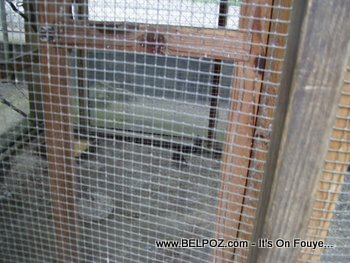 Next time you play a trip to Fort Jacques or Kenscoff Haiti, stop "Kay Wallace" and visit the little Haiti zoo in the mountains above Port-Au-Prince.